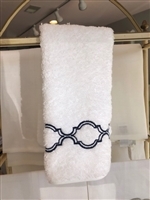 Matouk -Enzo towels are made from Matouk's luxurious Cairo long-staple cotton terry and enhanced with 1/2 inch linen piping and attractive mitered corners. Adds just a special touch of detail to create a lush, refined bathroom. Complete the look with Matouk's custom monogramming services. Available in five towel sizes, a shower curtain, and a tub mat. Features a convenient hanging loop on the long end of each towel. Shower curtains are made on 100% White Linen. Shower curtains have piping on three sides. Made in the Philippines of fabric from Portugal. All Matouk products can be monogrammed. For more information on Matouk monogramming options, please click HERE.